AMAZING VIEW OF THE SUNRISE & SUNSET OVER LAKE ONTARIO! A breathtaking lake home with oversize windows that make the sunrise and sunset unforgettable! 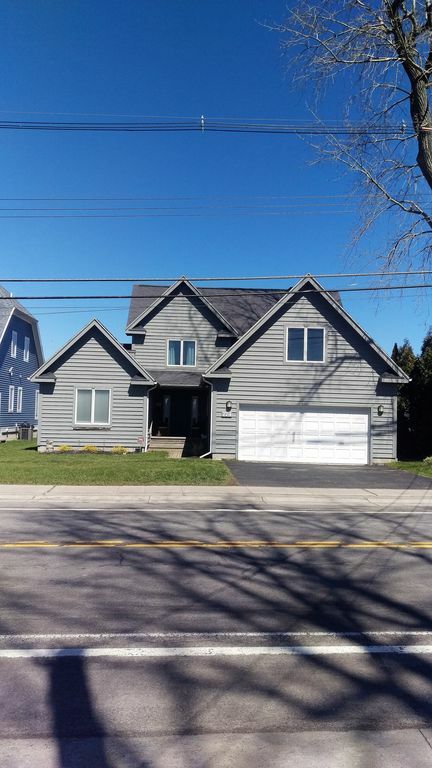 The home is nestled on a private beach along Edgemere Drive in Rochester, NY 14612. The size of the home is 2,350 square feet, it has a 2 car garage, 4 bedrooms (walk-in closets), a downstairs master bedroom, 2 full bathrooms, 1 half bathroom, A/C, laundry room, open kitchen with granite island for entertaining, a dining room overlooking the water, a large living room with oversize windows peering out to the beach/lake, a private wooden deck with furniture, patio and grill, and much more! I am from Rochester, NY. I graduated from St. John Fisher College where I earned a Bachelors Degree in Science for Business Administration. I have been married for 10 years and together we have 2 sons and 1 daughter. Unique, Modern, Clean - one of the most breathtaking properties in the world! We stayed at this home for Thanksgiving week with our family and it was wonderful. The home is beautiful, very clean, with a spacious open floor plan and gorgeous views of the lake. It is also very easy to get to into downtown Rochester from where it is located. This home was a perfect fit for our family of 6. David was fantastic to deal with as the host of the home. I highly recommend this vacation rental. Amazing views of the lake from this beautiful home. I loved everything about this home - well stocked with everything we needed and just a wonderful place to relax and enjoy the views. Dave was a wonderful host. We were in town for a college graduation but will definitely return when we have more time to enjoy the lake! A great place to stay. Beautiful home with everything you need. We rented the property for Christmas so our children could see snow and to see family that we haven’t seen in years. Came from Florida and we couldn’t have been more pleased with the place. Now my wife and mother want to come back in the summer to enjoy what the lake house really has to offer. If you are visiting the Rochester area and want to be on the lake you will not be disappointed with this place. Great place, great location on water, great stay. Beautiful views from a very spacious and well laid out home. We enjoyed our stay at this property very much. The sound of the waves from Lake Ontario was soothing and the views that hit you as soon as you walk through the door will amaze you. The house has all of the kitchen items you need to prepare your own food. Even when the weather did not cooperate and we could not be outside, we still loved watching the lake from the huge bay windows. What a wonderful house!!! The house was spotless upon arrival and David is wonderful to work with. We rented the house September 20 for a week as our son was getting married just down the road. This house was amazing and we were able to accommodate/feed many people with the constant flux with out of town guests and it was never crowded. The location is beyond words, even the beach, considering what the area went through this year with the high water. If you were not familiar with the location you would never have known. The house had everything you could need. You can even walk to 2 restaurants in less than 5 minutes and one has ice cream. I would highly recommend this rental.